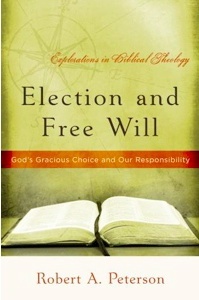 You can grab the first chapter of Robert Peterson’s book “Election and Free Will: God’s Gracious Choice and Our Responsibility” at the WTS website. Publisher’s Description: The first book in the Explorations in Biblical Theology series, Election and Free Will helps those who believe in a Reformed view of predestination to better understand their faith. It traces Scripture’s teaching on election through the Bible and explains biblically the doctrine of free will. It tackles objections to predestination and concludes with applications of this neglected biblical teaching. It is clear, strongly biblically based, and solidly Reformed. This book gives special attention to free will and seeks to apply election to contemporary culture. please send me this book I will be so kind of you as well as other holy and religious books as much as you can I am in research process for studying. i want to be bless by reading the book and to bless others too. Wanted to more about theological issues by reading your book. wanted to know more about theological issues by reading your book/books.